"Hey kid, you fire that up now, bound to be vamped real bad. Some real pathetic individuals around here. 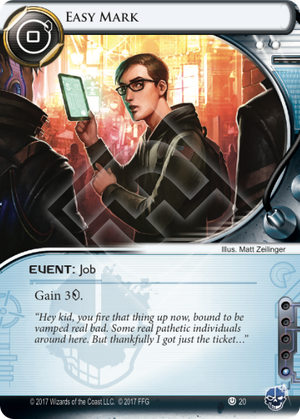 But thankfully I got just the ticket…"
With all the economy cards available to players now, this card can come across as underwhelming. It's not bad, it's just taking precious space that could be filled with more up-to-date alternatives. When considered strictly within the Core Set this card becomes a lot more attractive. Like Beanstalk Royalties on the corporation side, it gives you a free, instant boost whenever you need it. In practice I've found it more helpful than its face value suggests. Worst-case scenario: With no economy in play you'll spend a turn (probably closer to two) to even become a threat again. That Sure Gamble in hand, usually your smug partner in crime, will now look like it's going, 'Nahaha, look at you peasant! You cannot play at this table.' And the Corp player will be sighing, almost sorry for you, as you claw your way back to being respectable. Sad times. Luke-warm scenario: You have an Armitage Codebusting either in-hand or on the table. Good for you! That'll be for the credit, to install, and , for anything meaningful (closer to three to get back above the magic 5). That's still a turn spend recovering. If it's already in play, you'll eat through half of it getting back into Sure Gamble range, assuming you still have that much left on it. Not terrible, but not great. Easy Mark scenario: Even playing nothing but this and clicking for credits, you're back to 5 with a to spare for more economy, an install or a run. With Armitage down, you're back to 5 in two clicks, up to 9 in three with Gamble and still have time to run or install. It can bounce you back from a costly turn very quickly will keep you from losing any momentum. Dedicating a whole turn to making scratch feels like you're on the back foot. Maintaining an offence feels like you're doing what you have to. Doing both (efficiently) feels awesome. Basically that was a really long-winded way of saying, "It's good and like most 'burst economy', if you keep it for when you truly need it, it's value to you will increase hugely." Just installed that pricey new toy, can't afford non-criminal economy, and you didn't have other options? Nah, that wouldn't happen nowadays, right? Well, if that happened this would be a simple way to climb out of the non-Sure Gamble range. Fortunately, we all have great ways to build economy today.